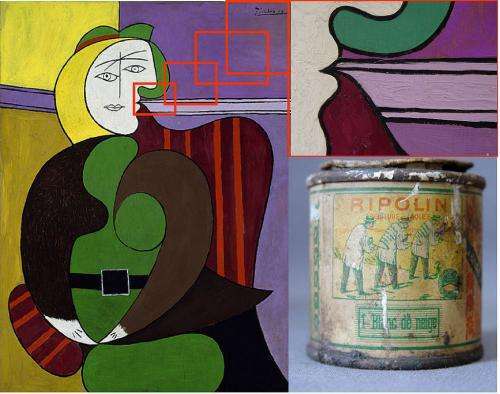 The results published last month in the journal Applied Physics A: Materials Science & Processing add significant weight to the widely held theory that Picasso was one of the first master painters to use common house paint rather than traditional artists' paint. That switch in painting material gave birth to a new style of art marked by canvasses covered in glossy images with marbling, muted edges, and occasional errant paint drips, but devoid of brush marks. Fast-drying enamel house paint enabled this dramatic departure from the slow-drying, heavily blended oil paintings that dominated the art world up until Picasso's time. The key to decoding this long-standing mystery was the development of a unique high-energy X-ray instrument, called the hard X-ray nanoprobe, at the U.S. Department of Energy's Advanced Photon Source (APS) X-ray facility and the Center for Nanoscale Materials, both housed at Argonne. The nanoprobe is designed to advance the development of high-performance materials and sustainable energies by giving scientists a close-up view of the type and arrangement of chemical elements in material. Volker Rose, a physicist at Argonne, uses the nanoprobe at the APS/CNM to study zinc oxide, a key chemical used in wide-band-gap semiconductors. White paint contains the same chemical in varying amounts, depending on the type and brand of paint, which makes it a valuable clue for learning about Picasso's work. "Everything that we learn about how materials are structured and how chemicals react at the nanolevel can help us in our quest to design a better and more sustainable future," Rose said. Many art conservators and historians have tried over the years to use traditional optical and electron microscopes to determine whether Picasso or one of his contemporaries was the first to break with the cultural tradition of professional painters using expensive paints designed specifically for their craft. Those art world detectives all failed, because traditional tools wouldn't let them see deeply enough into the layers of paint or with enough resolution to distinguish between store-bought enamel paint and techniques designed to mimic its appearance. "Appearances can deceive, so this is where art can benefit from scientific research," said Francesca Casadio, senior conservator scientist at the Art Institute of Chicago, and co-lead author on the result publication. "We needed to reverse-engineer the paint so that we could figure out if there was a fingerprint that we could then go look for in the pictures around the world that are suspected to be painted with Ripolin, the first commercial brand of house paint." Just as criminals leave a signature at a crime scene, each batch of paint has a chemical signature determined by its ingredients and impurities from the area and time period it was made. These signatures can't be imitated and lie in the nanoscale range. Yet until now, it was difficult to differentiate the chemical components of the paint pigments from the chemical components in the binders, fillers, other additives and contaminates that were mixed in with the pigments or layered on top of them. Only the nanoprobe at the APS/CNM can distinguish that level of detail: elemental composition and nanoscale distribution of elements within individualized submicrometeric pigment particles. "The nanoprobe at the APS and CNM allowed unprecedented visualization of information about chemical composition within a singe grain of paint pigment, significantly reducing doubt that Picasso used common house paint in some of his most famous works," said Rose, co-lead author on the result publication titled "High-Resolution Fluorescence Mapping of Impurities in the Historical Zinc Oxide Pigments: Hard X-ray Nanoprobe Applications to the Paints of Pablo Picasso." The nanoprobe's high spatial resolution and micro-focusing abilities gave it the unique ability to identify individual chemical elements and distinguish between the size of paint particles crushed by hand in artists' studios and those crushed even smaller by manufacturing equipment. The nanoprobe peered deeper than previous similar paint studies limited to a one-micrometer viewing resolution. The nanoprobe gave scientists an unprecedented look at 30-nanometer-wide particles of paint and impurities from the paint manufacturing process. For comparison, a typical sheet of copier paper is 100,000 nanometers thick. X-ray analysis of white paints produced under the Ripolin brand and used in artists' traditional tube paints revealed that both contained nearly contaminate-free zinc oxide pigment. However, artists' tube paints contained more fillers of other white-colored pigments than did the Ripolin, which was mostly pure zinc oxide. Casaido views this type of chemical characterization of paints as a having a much wider application than just the study of Picasso's paintings. By studying the chemical composition of art materials, she said, historians can learn about trade movements in ancient times, better determine the time period a piece was created, and even learn about the artist themselves through their choice of materials. It wouldn't surprise me if the cave painters of Lascaux used Glidden.